Dove Extra Sensitive Beauty Bar contains ¼ moisturising cream to nourish, protect, and pamper dry, rough, or sensitive skin. It has a mild formula that is fragrance-free, hypoallergenic and unscented, and is suitable for use in the shower everyday. I never thought i would need this! For a start i am a fan of antiseptic products. But as the age catching by, i tend to have lots more dry patch skin lately especially in winter so I started to use dove soap and its actually works and helps moisturise my skins. This soap is actually good to use on the face too. This soap does the cleansing, without removing the moist from the skin outer layer. The best soap ever and the only one I use! I have very sensitive skin and used to get very tight, itchy skin after having a shower or bath. I've been using it since I came about it at a friends place when I was 18 (I'm 38 now) and wont use anything else. It always leaves my skin soft and well hydrated. I always keep an eye out for when it's half price so to keep my bathroom well stocked. I've tried different brands for sensitive skin and even other Dove bars but although they may smell nice they leave my skin dry and/or irritated. I have never found one as good to my skin as the Dove sensitive bar. Don't leave the bar sitting in water (the bath) too long as it breaks down and just gets wasted and washed down the plug hole. If you use loofah gloves the bar lasts a lot longer. Sensitive, dry skin or even if you just want lovely soft skin without having to moisturise constantly. Although I love the classic Dove Beauty Cream Bar, my skin has a tendency towards sensitivity, dryness and eczema. 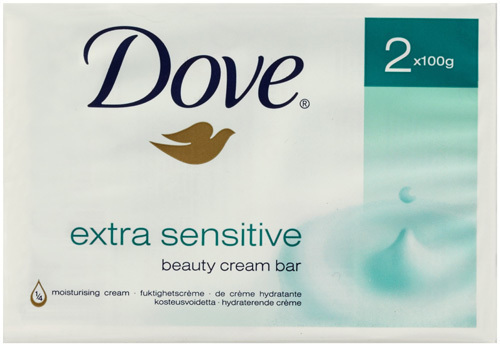 The Dove Extra Sensitive Beauty Bar is a great alternative for those of us with extra sensitive skin. It works just as fantastically as the classic Beauty Cream Bar, it lathers very well for something so moisturising and doesn't leave any nasty reside. I find my skin feels wonderfully soft after use and there is no irritation from this product at all. Unfortunately for those with super dry skin like me it may not be quite moisturising enough, I still need some deeply moisturising body lotion after use. Sensitive or dry skin. Everybody! A great soap for sensitive skin. This soap is really great for people who suffer from dry skin or have problematic skin as it is has a very sensitive formula and is non-irritating to the skin. I've used this soap many times and have found that it does not leave my skin feeling dehydrated or greasy. It is a lovely formula that makes the skin incredibly soft, clean and hydrated, it also feels as if you have used a dramatically different moisturiser instead of washing with a soap. - Lather the product up and let it sit and skin into the skin. I had trouble finding this at first and when I did I was more than happy. I love the Shea bar, it doesn’t irritate my skin even though it is quite strongly scented. The original bar though for some reason does make me a little itchy and when I was speaking to a friend about this she told me this sensitive bar existed so I made it a mission to track it down. Happy I made the switch, this bar is perfect for me. I travel a lot and always make sure I have one in my bag. After trialling it on myself I am quite confident to use it on my little ones, including my baby twins.  It is unscented and seems to be very gentle but also cleans well and leaves the skin soft. Absolutely no itchiness or irritation, very happy. I wouldn’t say I don’t need a moisturizer afterwards, I do, but I don’t have that sore stripped itchy feeling I get from all other soaps. Wish they would make a liquid version, I’d find that far more practical and hygienic but this is super for travel! I've been using this for a kitchen and bathroom handwash soap mainly as I find it's gentle on hands when I have to wash them regularly throughout the day. It doesn't dry my hands out as much as the usual soaps around. It's definitely more moisturising and it is great for use in the shower too as a shower soap. It is free of a lot of things that usually irritate sensitive skin like colours, fragrances or preservatives and it's readily available at supermarkets, chemists etc so it's the one I'll buy again! My eldest daughter has very sensitive skin and she can wash her hands with this soap too. Use it for a shower body soap too! Regular washing of hands as it doesn't dry the skin out. Best soap and great for kids! I've used every bar soap variety in the Dove range and I love them all. This one is just as good as all the others, it suds well, rinses off and doesn't leave my skin feeling dry or stripped. The only difference I found with this one - it is as good as the original version, but without any fragrance. I have slightly sensitive skin, mostly around my face. I've never reacted with this. My husband suffers dry skin and has used this one with no issue and we've also used it on our children (ages 4 & 6). No issues for anyone. A really good, affordable bar soap. Very nice bars with sensitive skin in mind. It is exactly like the normal bar, except without the smell. My skin still feels soft, hydrated and not dry at all. Great value for sensitive skins. This beauty bar doesn't irritate my skin or leave it dried out like most soaps do. It is a non-irritating soap but does a good job cleansing and making my skin feel soft. My skin is supple after using this soap. It is lightly scented but it is a pleasant scent. The soap bar feels creamy to the touch and bubbles up well while feeling creamy and soft on the skin. I would re-buy this soap as it is fantastic and gives me confidence that my skin is at its softest. I have allergy's to different soaps and what not, and this is one of the few that does not irritate my skin. I'm sad that its not fragranced but that's probably why my skins all irritated a lot, otherwise its a very good product and it moisturizes so well. Best moisturising soap on the market! A great soap for the lazy moisturiser and for those with sensitive skin. Lovely fresh scent, fine for men and women. I bought this product because I have sensitive skin and it was also reccomended. I was so shocked when I used it, it cleaned my skin, moisturised it and it felt so soft after using it. The soap also leaves your skin with a fairly nice scent! The 100g beauty cream bar comes boxed. It's used to cleanse sensitive skin and is fragrance free. The bar has the same skin loving 1/4 moisturising cream in the formula just like others in the Dove Beauty Cream Bar range. The bar is a creamy white shade. It's curved and oval and has a small dove etched on top. Even though it is fragrance free, it has a faint aroma that reminds me of cream. It produces a light milky lather that feels smooth on skin. It cleanses well without stripping skin of goodness and rinses easily from skin. The gentle formula doesn't irritate or dry out my skin. Keeps my skin feeling smooth and clean. It's perfect for daily use to wash hands and body. I was given the beauty cream bar to try. It would be good for those who like fragrance free cleansers. I personally like the original scented beauty bar variety. I am lucky enough not to suffer with sensitive skin, so I have the choice. If you do suffer sensitive skin the Extra Sensitive Beauty Bar variety might be worth a shot. The Dove Beauty Cream Bars are budget friendly, affordable. Lovely For Sensitive Skin Types! My husband has fair, sensitive skin so I bought this for him to use and he seemed to like it! He uses it in the shower and sometimes I find myself also reaching for it. It has absolutely no scent so it doesn't upset the senses or get up your nose. Feels moisturising and lathers up very well. Very happy with this one! I love this Sensitive Dove soap it not only cleans my skin but leaves my skin moisturised. It cleans really well without irratating my skin and has a clean scent I dont know what it is but it is nice. This is a great product for everyday use. Well priced and suitable for the most sensitive skin. It lathers beautifully and leaves skin feeling soft. I have been using dove soap for years after it was recommended to me. quickly if left in water. It's wise to keep it as dry as possible after use. Great for any skin type including sensitive. This is a very gentle soap to use. It is fragrance free with a lovely soft creamy texture. I have been using it on my body and face in the shower. It is quick and easy to be able to use the same product on face and body. This saves me a little time in the morning before work. It has not irritated my skin. And it doesn't leave my skin dry like most soap do. A very good buy. I would prefer a natural gentle fragrance though. I have really sensitive skin, so this product it like a holy grail product for me. It makes my skin feel soft, silky, cleansed & healthy without leaving an irritating or dry feeling. The products you can use on even the most sensitive areas. Should you be using unscented products?